The GoPro Suction Cup Mount will mount any GoPro camera onto a clean, smooth surface. It has been tested to withstand up to 150 MPH. It has a quick release base for easy re-mounting and is compatible only with GoPro quick release systems. Do not try and mount anything larger than a small adventure camera to this suction. 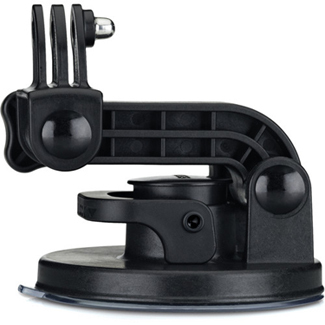 See the Matthews Suction Pump Cup or the Matthews Car Mounting System for a suction cup mount that works with larger cameras. It also isn't recommended for impact footage since the suction cannot withstand that kind of force (so not great for surfboards getting hit with waves). It is ideal for capturing motion on cars, motorcycles, and other smooth surfaces. • This GoPro suction cup mount is compatible with GoPro quick release mounting systems. • Do not try and mount anything larger than a small adventure camera to this suction. See the Matthews Suction Pump Cup or the Matthews Car Mounting System for a suction cup mount that works with larger cameras. • Suitable for clean, smooth car, boat, and motorcycle surfaces. Not suitable for snowboarding or surfing.